After winning a collective contract for workers at KFC, Pizza Hut and Starbucks, fast food workers in the UNite union now turn their attention to the most anti union corporation in the business, McDonalds. Months of negotiations have now revealed that their is no real willingness to engage by Golden Arches management, and workers there now appeal to the wider trade union movement and community to support them in the months ahead as they begin their campaign for $12 an hour min wage, secure hours and an end to youth rates. The McDonalds campaign will be launched in earnest this Friday Night (June 9th) at the Point Chevalier branch of McDs in Auckland. Workers are asking for support fro other trade unions, campaign groups and the wider community- all of us who are sick of poverty pay and anti union practices. The eyes of the world are now on Auckland.Spread the word. Bring down your banners. UNite promises to fight one day longer than the McDonalds corporation, and what promises to be a historic battle for labour rights of international significance. If workers in the Golden Arches can organise and win improvements here, it will create a precedence for millions of workers around the world in so called "McJobs". Do your bit, and bring at least two friends down. Great North Road, Point Chevalier, Auckland. Hmm, McDonalds for tea tonight! Strike a blow for Brave Multinationals! Yeah Ex. I'm a BK man, but now I'm backing Maccers. Thanks for that, I did not know about it. You've just increased the attendence at the event by two. So now there will be 5 nutters there draped in their Soviet flags and in their Che tops. 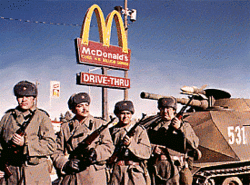 Wwll, I went to McDs in Invercargill as an act of Solidarity with McDonalds (as well as half of Invercargill is seems).